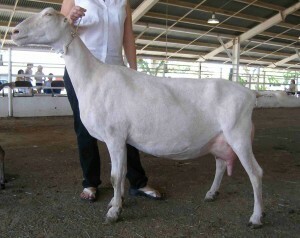 The American LaMancha Goat is one of the most unique looking goat breeds today. Known for their high quality milk, Lamanch Dairy Goats are a lesser known, but increasingly popular breed. As the only goat breed developed solely in the USA, the LaMancha is probably best known physically for it’s very short ears, which are sometimes so short they almost look like they have been cut off! No need to worry though, none of these goats have had their ears removed, it’s a genetic trait called the “Gopher Ear”. The LaMancha is noted for its very short “Gopher Ears” and the breed standard states that they should be no longer than 1 inch long, and it’s preferable to have no ear cartridge present at all. However, there is also another type of ear that is acceptable; the slightly larger “Elf ear”. The Elf ear is allowed to be up to 2 inches long and some cartridge is allowed. Read more about the unique ears of the LaMancha here. The LaMancha breed was developed in the 1930’s in Oregon by a goat herder named Eula Frey after she bred some of her Swiss and Nubian bucks with short-eared does of Spanish ancestry. The resulting goat had shorter ears but was a great milker and could withstand the tough Oregon winters with ease. The breed also possessed a calm and gentle temperament which has led to its popularity amongst farmers in the 80+ years since Mrs. Frey first bred them. Today the LaMancha breed is governed by the American LaMancha Club. Despite being one of the more popular goat breeds in the United States, there is a surprisingly small amount of information out there specific to raising LaManchas. The reason for this is because raising a LaMancha goat is very similar to raising an Alpine or Nubian goat. With any of these breeds you are going to want to follow some basic guidelines when raising them for milk production. LaMancha goats need a balanced diet high in nutrient and protein to produce high quality milk. In addition to natural grazing you need to feed them supplemental roughage in the form of hay or alfalfa and should also give them a small amount of high protein dairy grain ration that you can purchase at any local feed store. Similarly to the Saanen breed, it’s important that your LaMancha Dairy goats have plenty of grazing pasture, not only for eating, but also as an area to explore and exercise. The mental state of goats can contribute greatly to their ability to produce milk. Having a large area for them to explore, run around, and graze in will ensure that they remain happy and healthy. In addition to their outside space, you will need to have some sort of a structure that the goats can use for shelter during bad weather, especially in the winter. LaMancha goats are hardy and can survive in some tough conditions, but that doesn’t necessarily mean it’s best for them to be outside in below 0 temperatures or out in the open during a snow store. Provide them with a structure that has at least three sides and a roof; however an enclosed barn is best. Keeping them protected from the elements will also help to limit the chances for winter time diseases such as pneumonia. Make sure they have a clean and dry place to lay down, even if that means spread hay down daily for them. A good general rule of thumb is that you should provide 15 square feet of sleeping area for each goat. And of course, keep the Bucks separate from the milking does. You should make sure to dehorn your goats when they are very young, but now before 2 weeks old. Be sure they are in good health before dehorning, as the dehorning wounds can open up a young sick goat to additional infections and possible death. Check your goats frequently for signs of sickness, a normal goat will seem alert and active, have a heart rate around 85 beats a minute (but can range from 50 to 120 beats). 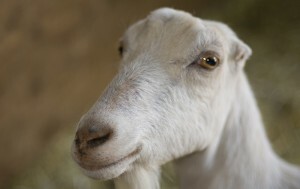 Goats have a slightly higher body temperature than humans at 103.6 degrees Fahrenheit. As with most goat breeds, your best bet for finding LaMancha Goats for sale near you is to as a local farmer who has goats if they know of anyone who is looking to sell a LaMancha. Even if they personally don’t know anyone, chances are pretty good that they could put you in contact with someone who does. Most livestock sale barns don’t sell goats anymore and even those that do don’t usually sell them frequently, so heading to the local sale barn will be very hit or miss. A better bet is to head to a local county fair, or livestock show where goat farmers will be showing their stock against each other. Not only will you be able to find a whole bunch of people who probably have goats to sell, but you will also be able to form connections and have questions answered by people who are experts on the subject of LaMancha Goats. You will probably see some results for breeders near you, however even if you don’t you can contact the “American LaMancha Club” through their website and inquire about breeders close to you. Although they don’t publish a list of breeders on their website, chances are good that they know of any breeders who might be close by!